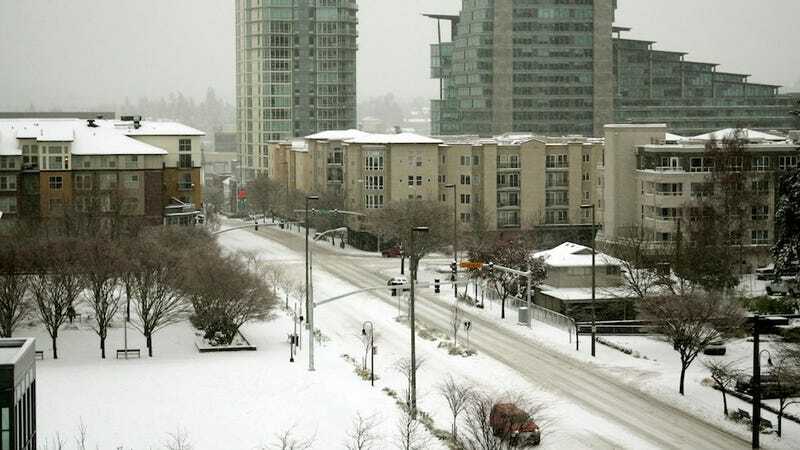 Hey, Seattle Gamers and Game Developers, Show Us Your Snow! We hear that Seattle is covered in ice and snow is a total mess. We've even got this picture from near the offices of Bellevue-based developer 5th Cell to prove it. Are you in Seattle and covered in the snowpocalyspe? Show us in the comments section below. We want to see your winter wonderland. The folks at FunBits Interactive had some fun with this one, inserting a character from their upcoming game Escape Plan into the snow. Good times, guys. LordMoon has a new greeter at his building. Tron86 takes a break from TOR for long enough to notice that it's snowing. Weird Ice lives up to his/her user name. Stantonsteward found what is doubtless the den of an abominable snow-serial-killer. AveryCloseCall spies some snow-car-dragons on the way to PopCap. View from the window of Tera maker Bluehole's Seattle office. rkmacpherson sent in the rooftop garden beneath En Masse entertainment.